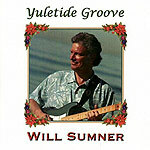 For a guy who lives in San Diego County, guitarist Will Sumner keeps a pretty low profile. Our loss, because his new Christmas CD is one of the best holiday releases in a jazz vein in some time, with Sumner showing himself to be a stellar picker. Playing with a nice fat tone and a wonderful ear for improvising off the main theme, Sumner's nine-track set of holiday classics is solid enough that if you were making a mix tape of Christmas songs by jazz guitar greats, you could add tracks from here in among the Wes Montgomery and Joe Pass and they'd fit right in. No surprises songwise: "Winter Wonderland," "Silver Bells," "O Come All Ye Faithful," etc.  Sumner playing all the guitar and keyboards, and yet the final mix sounds very fresh and organic and not at all overdone. Guest vocalist Scott Woker sits in on "The Christmas Song" ("Chestnuts roasting ..."), and displays a warm, conversational singing style, with Rik Ogden providing a nice contrast on saxophone. And Sumner and pianist Sky Ladd just slay "O Christmas Tree," with Sumner's guitar lead bouncing along atop Ladd's comping on piano  until Ladd takes a chorus out front, and makes this critic wonder how it is that he's never heard of Sky Ladd. Sumner may be a local, but you don't buy this CD to support local music  you buy this CD because you love jazz and the holidays, and this gives you the best of both worlds.